"Add color to your wardrobe without sacrificing style on the road"
The Sofia, handmade in Spain, it's a semi brogue shoe in color wine, very stylish and perfect to use them in more relaxed work environments and to combine with a more casual look. This model is ideal to extend the pallet of colors of your wardrobe without sacrificing not even a little bit of distinction and elegance in the process. The Sofia is the perfect shoe for being a point of reference in a less reloaded look. Thanks to the color and the details of the brogue, these shoes are ideal to wear them with a casual look like jeans and a white shirt. 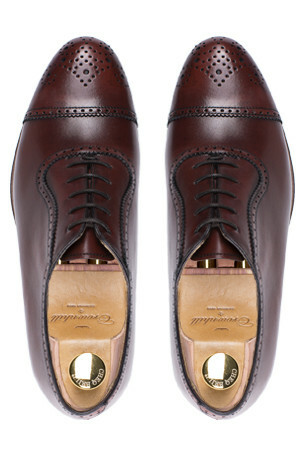 But don’t forget; do not underestimate the elegance of these by wearing them with a blue or gray suit. The only thing you have to keep in mind is to use them with some accessories like a belt, a bow or a necktie. The Sofia is a shoe made in first quality box calf, hand-sewn following a Blake construction. Mounted on our Wellesley last, and we obtain a more elongated and rounded toe cap. The leather sole has a non-slip rubber embedded Spy, which will get that rainy days won’t be a problem anymore. In addition, our patented Flexi Comfort system will absorb the weight of the foot making your feet comfortable. Se trata de un zapato de calidad,comodo,destacando el color de este modelo,lo hace muy diferente y unico. Al igual que otras compras,satisfecho con la compra,con los plazos de entrega y con el formato en el que se entrega. Sapatos fabulosos. No entanto, as solas de couro apresentam bastante desgaste ao fim de 26 meses, deveria ter isso em consideração. Apesar disso voltaria a comprar porque os sapatos são muito bonitos e bastante diferentes. Zapatos muy bien hechos, con materiales de calidad y excelente diseño. Son realmente bonitos. De momento, los tengo en proceso de rodaje, pero se me van adaptando muy bien al pie. El trato ha sido muy atento en todo momento. Sapatos perfeitos e de grande qualidade. São a minha escolha sempre que procuro marcar a diferença. Serviço online e de apoio ao cliente de enorme rapidez e atenção na resposta ao cliente. Recomendo a qualquer homem a escolha. Mi valoración es de 10 sobre 10. Me parecen zapatos cómodos, elegantes, de diseño a la moda y de muy buena calidad. These shoes are great quality and look very well made. The leather is of the highest quality and the shape of the toe is perfect. I would recomend these shoes to a good friend in the knowledge that he would be very happy. If I could score any higher I would. Very stylish and beautiful shoes. The leather is of high quality and the hand finished color is suberb. Spacious instep and confortable sole. Very long breaking in period (due to quality of leather) but once you break in they\'re very confortable. The color of the leather is elegant.